One of the major new technological advances in green energy in recent years, the Flow Boiler was developed to be the smartest on the market, providing low cost heating but also generating valuable, low cost electricity. Launched at the end of January 2015, the Flow Boiler is aimed at domestic residences and, if your home is suitable, you can make some big savings on your bills over the next few years. What is the Flow Micro CHP Boiler? Produced by innovative design energy company Flow, who have been in the market since 1998, it looks like a normal boiler but has been developed to produce electricity that feeds into your home as soon as the installation starts producing heat via the gas supply. The benefits over other boilers is that it cuts down your electricity costs whilst at the same time reducing your carbon footprint, something many households are now looking to do as they upgrade their existing energy hardware. A standard size gas boiler that is reliable and efficient. Intelligent technology that helps use the heat you generate to produce low carbon, low cost electricity. For a normal household with average usage, the Flow Boiler can produce up to half the electricity needed to run the house in a year. That presents big savings when it comes to those energy bills. Not only does it reduce your carbon footprint but comes with some attractive financial packages that means that you may only need to pay for the installation, not the hardware the company puts in. 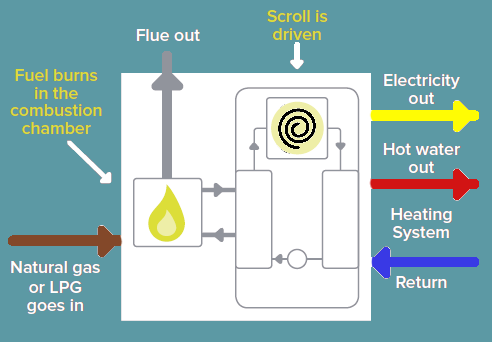 The technology for generating electricity from a boiler is fairly simple to understand. Essentially when the gas heater bursts into action it is not only used to warm up your home and water but also heats up a special liquid in the micro CHP power module that lies at the heart of the electricity production. This liquid evapourates and moves through a scroll expander that begins to spin acting like a small dynamo. This technology is similar to the turbines that produce electricity in our power stations – the spinning creates an electric current which can either feed out into the house or be exported to the grid. 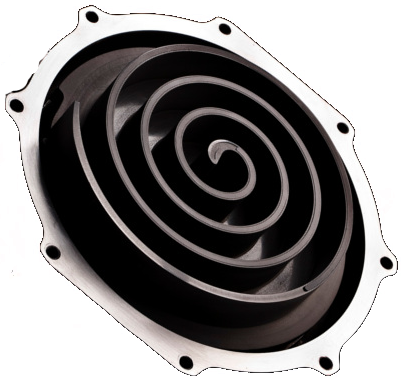 The vapourised liquid operates in a similar way to refrigeration technology, once it has passed through the scroll expander it condenses back into a fluid and is returned to the starting point. Then the entire process starts again, essentially working in a loop to generate valuable electricity. The problem in the past is that producing technology such as this has subsequently made it more expensive for the average consumer to buy. Whilst that’s largely still the case, the fact that it is manufactured here in the UK means the Flow Boiler comes with a solid reputation and, more importantly, some innovative financing packages where customers don’t have to actually pay for the hardware but only the installation. The company’s plan is to make it more and more affordable and profitable for just about anyone who wants to have the boiler installed. The 18 kW boiler is small and lightweight and comes with a 92% A Class efficiency which means it’s one of the most carbon friendly units currently out there. The boilers are made in Scotland by the company Jabil who are one of the leading manufacturers in the world today. The actual unit was developed in Chester at the Capenhurst Centre where over the last 10 years researchers have been working on the technology at a cost of £60 million. The boiler has been manufactured with common refrigeration components, making the unit both compact and a very affordable machine for the production of heat and electricity. It also is by reducing the relative cost and size of the unit that enables the Flow to compete directly with efficient standard condensing boilers currently on the market. Whilst the cost of a Flow Boiler is higher than more traditional ones on the market, it’s link to the Government’s Feed in Tariff means that the higher costs can be offset by the money made from selling power to the grid. Because it is associated with the Feed in Tariff, home owners can either opt to buy the boiler outright or get it for free (paying for just installation) and handing the profits from the FiT to Flow until the cost of the boiler is repaid (find out more below). The company says that the more units it sells the quicker the overall price can become competitive and that it will present a huge sea change in the way we heat our homes for the future. Under normal circumstances the Flow boiler will generate around 2000 kWh of electricity if your premises consumes 35,000 kWh of gas each year. That means if you use 100% of the electricity generated on site, you will save 16p x 2000 kWh or £320. At 50% you will save £160 and so on. As a result of the electricity being generated on-site, with no transmission losses, the unit aims to cut household CO2 emissions by roughly 1000 kg yearly, all at 35% of the cost of grid supplied electricity. That doesn’t take into account the efficiency savings of the boiler itself which may well reduce your heating costs depending on the type of boiler system you already have installed. Flow estimate that with all the savings you should see a return on investment within the first five years of having the boiler installed. Replacing an ageing boiler is even more advantageous – older systems are inherently inefficient and moving to better and newer technology can dramatically reduce the amount you are spending on your gas bill. 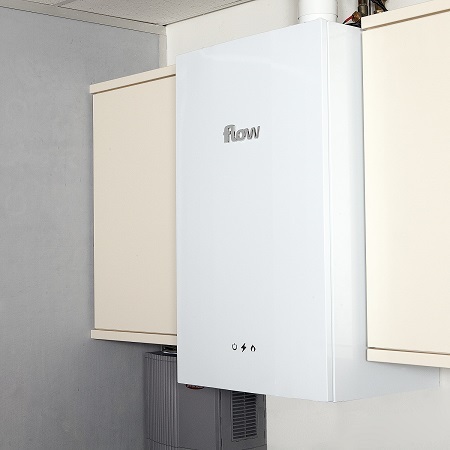 Flow offer three separate ways to finance the installation of their new boiler which means that it is instantly available for a wide range of consumers, including those who cannot afford the upfront cost. Option 1: You pay for installation, the Flow Boiler is provided without any initial outlay but is paid for through the Feed in Tariff. Once Flow have assessed your premises to ensure that it is suitable for a boiler to be installed you will need to switch your energy supply to the company and you will need to stay with them until the value of the boiler is paid off. Flow state that they offer some of the lowest energy rates in the market and their aim is to keep your payments down over the five years of the agreement. You will need to sign a five year finance agreement when you select this Flow Boiler option but you won’t really notice the payments you make as it will be incorporated into your bill (working in essence in the same way as The Green Deal Loan). At the end of the five years, the finance agreement finishes and the boiler is paid for – it belongs to you and you can then benefit from the Feed in Tariff, depending on how much electricity you generate. Option 2: You pay for the installation and the cost of the boiler. If you sign up to have your energy provided by Flow and hand over the Feed in Tariff to them you will be guaranteed a reduction in your energy bills every month over a five year period which means that the total reduction will be more than the amount you paid for the boiler in the first place. At the end of 5 years you can start receiving the Feed in Tariff payments as well as getting lower cost energy. The difference is that the reduction is not guaranteed as in the first five years but depends on how much electricity you generate through the Feed in Tariff. Option 3: The final option is to buy the flow boiler outright and benefit from the Feed in Tariff yourself. You could well see a benefit of up to £500 a year if you use the right amount of heating with the boiler and you would be free to use any energy supplier that you want. Many potential customers would find the installation of the Flow Boiler more prohibitive, even with its extra electricity production, if there wasn’t something additional on offer. The Feed in Tariff pays you money for the renewable electricity you produce which is then fed back into the National Grid and is available for Micro CHP boilers. It is essentially a central fund that is used to encourage homes and businesses to go for more carbon friendly technologies and pays for every kWh produced. These rates are set by the Government and may well change over time but can help get a decent return on investment over the lifetime of the product. How Green is the Flow Boiler? Whilst the energy efficiency and savings of the Flow Boiler are important to most consumers, the carbon neutral credentials are also something many like to take into account. Flow pride themselves in trying to provide a green heating technology that makes a difference – with normal usage they expect the system to reduce your carbon footprint by up to 20%, the equivalent of driving for 4,000 miles in your car each year. It’s not just the individual contribution that needs to be taken into account here. If there are 1 million Flow Boilers installed in the UK then that could reduce our collective carbon emissions by as much as a million tonnes a year. Whilst we are moving ever closer to carbon neutral technologies such as solar and wind, gas is still an integral part of our energy production and will be for some time to come. Using it more effectively and reducing our impact on the environment are vital if we are to engage in more sustainable and greener energy production. If many houses are producing their own electricity then that reduces the strain on the grid’s capacity. Flow believe that the installation of half a million boilers would produce the combined power of one big power station. Is Your Home Ready for a Flow Boiler? The bad news is that not every home is suitable to have a Flow Boiler installed and there are a number of prerequisites your property will need to comply with, which is why the company undertakes an initial assessment before agreeing any contract. You room for installation will need to be the right size – more than 13.5 m³. The flue length for your installation should not exceed more than 4.5 m.
The energy needed to heat your house and the water should not exceed 22 kW. The heating system needs to be single zoned (usually indicated by the fact that you have just one thermostat). For maximum efficiency you should have made all effort to ensure your home is not subject to excessive heat loss by installing such measures as cavity wall insulation, double glazing as well as lagging the loft. Find out more about insulation here. As with most power companies, customers don’t just want a good, energy efficient product but will be looking for those value added extras to make it worth their while. Flow boasts a UK based customer service team that offers good response times to any problem you may have with your Flow Boiler. The stats show that they have fewer complaints that most other companies including the major players such as British Gas and Scottish Power. Each boiler installation comes with 24 hour a day, 363 days a year service provision whether you’re within the warranty period or not. They generally use a company called Mears who have around 30 years of dealing with boiler customers and providing a high standard of service. The manufacturers’ warranty for the boiler is 2 years but the warranty for the electricity producing components are actually five years. While Flow are the innovators in the market at the moment, the development of gas boilers that actually produce electricity and save you money on the Feed in Tariff could well be one of the major technologies of the future. Whilst we are hoping eventually change to a more carbon neutral future with the development of truly renewable energies, we are still closely tied to fossil fuels and working more efficiently with them is as much a part of the low carbon agenda as anything else. At the Renewable Energy Hub we think this is one of the most exciting developments in green technology in recent years, with the potential to bring affordable micro generation to a large number of domestic households across the UK. The finance packages currently available from Flow are designed to generate greater installations, something that will the help to bring the cost down more quickly. A boiler that produces electricity whilst it heats up your house. A potential to earn up to £500 a year on the Feed in Tariff. Currently available with some great financing options that means you can have a Flow Boiler and just pay for the installation. The company will be launching a huge advertising campaign in 2015 and is already looking for companies to join their accredited list of preferred installers and you can check if there are currently any in your area on our database of installers here.